The Club has a strong focus on environmental awareness and is active in a number of on going environmental activities. The Driver Training includes an environmental module educating the drivers in Minimum Impact on the Environment. The club has a core group of active volunteers and as such has established its ‘green credentials’. Over recent years some 3,000 volunteer hours have been recorded annually with club members travelling tens of thousands of kilometres to complete projects. Our regular projects include participation in Clean up Australia Day and National Tree Planting Day with additional environmental work being done in the Flinders Ranges. Our work here includes tree planting, with supporting dripper irrigation although a major project has involved the eradication of wheel cactus (Optunia Robusta) a declared noxious plant in the Flinders. Work over 6 years has seen some 16,200 plants removed from both Oratunga and Gum Creek station, near Blinman which borders the Flinders Ranges National Park and has halted progress of cactus spreading through the park. Where possible the club will look to link volunteer activity with a trip or outings so it becomes a mix of work and leisure. Club members also assist when major disasters occur and in recent years have assisted fire victims of both the Pinery and Kersbrook fires. Members have also travelled north into the Arid Lands to assist with restoration work on old buildings, including the rebuilding of a 100 year old Shephard hut and assisted National Park Rangers at Innaminka with fish and wildlife stock counts. 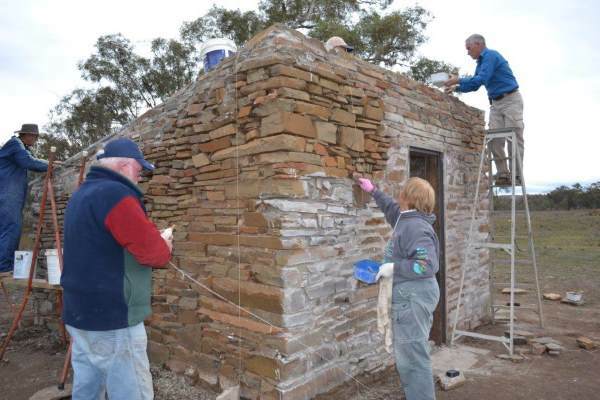 The Club has been involved with Kudremitchie Outstation near the Coongie Lakes since 1994 undertaking annual trips to help in restoration and preservation of buildings that sit adjacent the banks of the Copper Creek. The outstation is used by research workers but is also available for any TLCCSA members or four wheel drive clubs that are affiliated with the parent body 4 Wheel Drive SA.